You won’t believe this, because they’re so subtle, but every so often EB Games—the Australian outpost of GameStop— has a sale. Like the store in the image above. They’re having a sale believe it or not, the biggest sale ever apparently. But you’d never know unless you actually walked into the store. 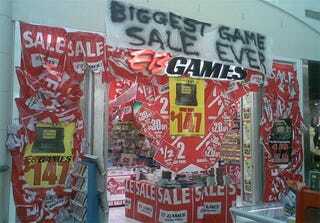 Clearly it wasn’t the biggest sale ever though, surely this one is. It has to be. It has more red. The more red it has the bigger the sale. Obviously. By that reasoning this is the biggest sale ever. I mean seriously, this store has to step its game up. Not even close to enough banners in this one. Bonus point, however, for the frills. A nice touch. This store isn’t even trying. Come on man? Clearly scrimping on its ‘SALE’ banner budget. I am, however, truly enjoying the relaxed way the banners are strewn around everywhere. This picture is just too damn yellow. Blurry pic, but I’d this is a well crafted EB Games storefront. I am definitely aware that a sale is going on. There is a lot of red here. Tastefully lit. Beautiful contrasts between the red of the banners and the store inside. Uninspired. Flat. Featureless. These sales banners have too much white. This store front has datedterribly. Actually, this one is quite tasteful. But how am I supposed to tell if there really is a sale in here? Honestly. No commitment here at all. You have to know the rules to break the rules. Pure genius. This post originally appeared on Kotaku Australia, where Mark Serrels is the Editor. You can follow him on Twitter if you’re into that sort of thing.